A parliamentary report of 1777 recorded a large workhouse in operation at Helleston (an old spelling of Helston) accommodating up to 200 inmates. Cornwall: St Anthony, Breage (5), Crowan (4), Cury, Germoe (2), Grade, Gunwalloe, Helston (4), St Keverne (3), Landewednack, St Martin, Mawgan (2), Manaccan, Mullion, Ruan Major, Ruan Minor, Sithney (3), Wendron (4). The population falling within the Union at the 1831 census had been 29,177 with parishes ranging in size from Ruan Major (population 162) to Crowan (4,332) and Helston itself (3,293). The average annual poor-rate expenditure for the period 1834-36 had been £7,515 or 5s.2d. per head of the population. 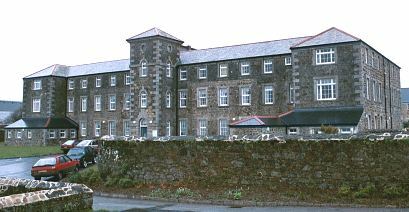 The new Helston Union initially made use of existing parish workhouse premises on Wendron Street in Helston (for up to 100 inmates) and at Breage (for 120). However, in 1855 a new workhouse for 280 inmates was built on a sloping 3½ acre site at the east side of Meneage Street. It was designed by Fred William Porter who was also the architect of the Falmouth workhouse. The cost of site and building was £5,267 and Mr Porter received a fee of £50. The workhouse location and layout are shown on the 1906 map below. The entrance to the site at the west featured a central archway with lodge buildings at each side, one of which may have included the Guardians' board-room. Helston entrance from the south-west, 2001. The main accommodation block was of three storeys with transverse blocks at each end and central rear wing. Helston main block from the south, 2001. An infirmary block, now demolished, stood to the rear. After 1930, the workhouse became a Public Assistance Institution. After 1948, as part of the National Health Service, it became Meneage Hospital and provided geriatric care, eventually closing in the 1990s. The surviving buildings have now been converted to residential accommodation. Cornwall Record Office, Old County Hall, Truro, Cornwall, TR1 3AY. Few records survive. Holdings include Guardians' minute books (1850-1894).